The human imagination never ceases to amaze and astound me. Give a creative person a blank (body) canvas, a Magic Marker, a camera and a Tom Waits song, and you get this marvelous stop-motion message of hope and invitation. This image is one of 30 or so pieces that comprise Alastair Whitton's "Patmos and the War at Sea", featuring images from WWII re-shot and developed by the artist, alongside apocalyptic texts in Braille that have been lasered flat and mounted behind glass (so if you "see" by touching something, you're out of luck). The pieces are reminiscent of a book, but the pages are numbered out of sequence, suggesting chaos or a sense of being "outside of time," as war can often feel, especially to those in the throes of it. I was moved by this image of paratroopers dropping on D-Day. Like the blind person trying to read a flat surface, the soldiers at Normandy must have felt a certain sense of "going in blind," eliciting fear, chaos, and probably frustration. In his choices of medium (paper, photography) and subjects (war and the apocalypse), Alastair Whitton pulls together two stark realities - one already, the other not yet - and aligns them in such a way that the viewer, if she gazes rather than glances, will be drawn in to the battle and left to contemplate what it really means to "see." embed What do artists have to do with the church nursery? Continuing with the theme of the past week, here's my recent interview with W. David O. Taylor for IAM Conversations, a delightful dialogue inspired by For the Beauty of the Church. Any legitimate conversation about church communities will eventually lead to the topic of "The Children's Wing," and ours, I am proud to say, was no different. What do artists have to do with the nursery? David has some thoughts, but they're probably not what you expect. I first discovered Nigerian author Chimamanda Ngozi Adichie when she was featured on the cover of my copy of Poets and Writers magazine. She was so striking on the cover, with her bold red head wrap and beautiful gaze, and her interview revealed a very intelligent, inspiring woman—I couldn't wait to read her work. In this video, Ms. Adichie talks about the danger of hearing only a single story about another person or country, risking a critical misunderstanding about their depth, beauty, intelligence, and humanity. Last year, Mae embarked on a new method of music-making and audience-engagement that incorporated philanthropy as part of an experimental sustainability model. In response to the recording industry's shifting paradigms, the band, which has been on Tooth and Nail and Capitol Records, has started their own independent label, handling all of their own booking and promotion. Here, Jacob Marshall, Mae's drummer, reflects on the band's landmark year, giving good insight into what is next for musicians hoping for sustainable recording careers. Recently, I featured author and film critic Jeffrey Overstreet on IAM Conversations. Having just read his book Through a Screen Darkly, I was eager to chat with him about the Oscar nominations and his latest novel, Raven's Ladder, the third in his excellent Auralia Thread series. I love Jeffrey's passion for film and storytelling, and I can't wait to meet him in person at IAM's Encounter 10 in a few weeks, where he'll be responding to our question, "How then shall we tell stories?" Last month the author and artist Jerry Pinkney was awarded the highest honor for an illustrator of children's books: the Caldecott Medal. His wordless retelling of the classic Aesop fable, The Lion and the Mouse, contains stunningly beautiful renderings of this heartwarming story, set in the African Serengeti, that reminds young and old alike that no act of kindness is ever wasted. In this video he invites us into his studio to get a bit of background on this remarkable work of art. This picture was taken by IAM's Bangkok liaison during a recent gallery tour in Thailand, and I found it to be quite startling. At first glance, the sculpture by Thai artist Lolay of a futuristic female figure sitting on a bucket like a busker was pretty interesting to me on its own. But then I noticed the little people walking around under her and realized the huge scale of this piece, which stands over twenty feet tall at the Bangkok Arts and Culture Center. According to the artist's statement, she represents human beings adapting to unpredictable changes in the economy, environment, politics, technology, etc., and the 'Dollar' name pertains to the United States and how it affects the rest of the world in so many aspects. photo Is that a rug you’re wearing? The current exhibition at Signs of Life gallery in Lawrence, KS, is the Beauty, Art and Life Movement (b.a.l.m.) White Show, featuring 49 artists from 19 states and Puerto Rico. 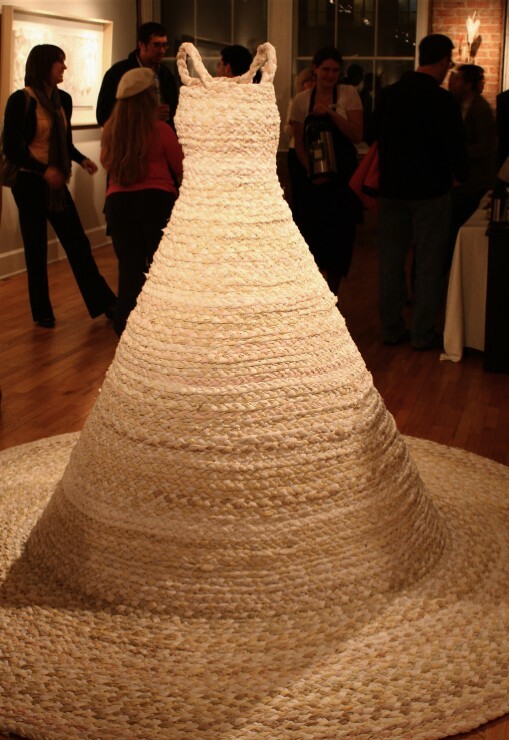 The show was juried by Samuel W. Kho, who says of this piece by Betsy Timmer, "There may be other artists who conjure dress forms, but Betsy Timmer's Rag Rug is rather seamless (pun!) in colliding a rug with a dress, direct like deadpan humor." This is the second of three posts from this site’s current contributors, about our favorite books, music, and movies of 2009—not necessarily made in 2009, but consumed, pondered, enjoyed and treasured by each of us during the past year. Yesterday we heard from Nate Barksdale; tomorrow we’ll close the series with Andy Crouch’s recommendations. Two of the movies that moved me most in 2009 deal with human suffering and hope in the midst of despair: Courtney Hunt’s Frozen River, a haunting story of survival and the sometimes blurry lines between right and wrong, and Scott Blanding/Brad LaBriola/Greg Heller’s documentary, Women in War Zones, which tells the story of two survivors of sexual violence in the Congo. I was also surprisingly touched by Kenny Ortega’s This is It, a film documenting the last few months of Michael Jackson’s life, rehumanizing The Gloved One and presenting him as the phenomenally talented, humble and generous, albeit broken, entertainer he was. After years of reading mostly non-fiction, I read several novels in 2009 that had a tremendous impact on me. One was My Name is Asher Lev, by Chaim Potok. Its insight into the mind of a visual artist was very helpful to me as someone who is trying to understand how visual artists see the world. I also appreciated the author’s profound insight into Christ’s crucifixion from the perspective of a Hasidic Jew. Marilynne Robinson’s Gilead was very moving to me on several levels, not the least of which was the way the main character was awakened by tender eros in his twilight years. But the book I read in 2009 that I was most stirred by was actually an unpublished manuscript by a very promising author practicing law near the University of Virginia. Corban Addison’s A Walk Across the Sun deals with the issue of human trafficking in both the US and India. It was the first time in a while I have had serious trouble putting a book down; I was riveted from page one. My non-fiction treasures of 2009 include Michael Card’s A Sacred Sorrow: Reaching Out to God in the Lost Language of Lament, Nicholas Wolterstorff’s Art in Action, Dan Siedell’s God in the Gallery, Eugene Peterson’s A Long Obedience in the Same Direction (a pastorally-guided exploration up the Psalms of Ascents), and Lewis Hyde’s The Gift, required reading at International Arts Movement as we seek to approach the arts not in terms of commodity, but rather in terms of gift. Most people who pay big bucks for orchestra tickets will never know the joy of receiving music as a gift. While music will not change these homeless people's situation in any pragmatic sense—they are still homeless at the end of the concert—I think one of the workers hit the nail on the head: "Mr. O’Connor said he was struck by how the men opened up after hearing the two violins in dialogue. 'Maybe through this music there’s healing,' he said." Just three blocks from Lincoln Center, they arrived at the concert on Thursday night by shelter bus, not taxi or limousine. They took their seats around scarred, round folding tables. The menu was chicken curry and rice served on paper plates. These concertgoers were eight tired, homeless men who had been taken to the Holy Trinity Lutheran Church shelter for the night. They listened to the latest performance by Kelly Hall-Tompkins, a professional violinist who has been playing in shelters for five years under the banner of Music Kitchen. Ms. Hall-Tompkins is not the only do-gooder in the classical music world. Orchestras nationwide took part in a food drive this fall, and Classical Action raises money for AIDS programs through concerts and other activities. Hospital Audiences brings musicians and other performers into wards. But most classical music institutions — orchestras, opera houses and conservatories — pour their philanthropic efforts into large-scale music education for children, supported by hefty fund-raising and marketing machines. They organize youth orchestras; play concerts in poor, urban schools; and provide lessons. Music Kitchen has a catchy motto (“Food for the Soul”), T-shirts with a logo and a pool of donors. But the operation is essentially Ms. Hall-Tompkins, 38, an ambitious New York freelancer who plays in the New Jersey Symphony and has a midlevel solo and chamber music career. This is not at all your stereotypical Christmas song, but it expresses more accurately how I often feel this time of year. While I love Christmas, I find myself taking long walks, acutely aware of the bleakness all around me—skeletal remains of once-vibrant trees, bone-chilling coldness, and a general sense of longing for loved ones who have passed away and relationships that did not work out. I haven't seen the eponymous Japanese film from which this song comes (about prisoners and guards in a WWII Japanese POW camp), but this gripping performance by Sakamoto is part of my Christmas soundtrack. These undergrads at Columbia are surpassing every other effort I have seen at green living. Regardless of what is or is not happening with the climate, this short news article inspires me to think once again about what it means to be given the mandate of caring for that which God called "good." I'm embracing the the 5-minute shower and unplugging unused appliances, but I'm afraid I have to draw the line at worm bins in my bedroom. Todd Nelson, a Columbia sophomore, plans a double major in environmental science and history with a focus on industrialization and the rise of consumerism. He sleeps next to a worm bin where he composts food scraps. He’s one of 13 students in Columbia’s GreenBorough dorm, where an experiment in sustainable living launched this semester is a competitive sport. Showers are limited to five minutes (Nelson’s personal record is 1:50). A chart on the wall keeps track of offenders who forget to turn off lights and unplug appliances. The house won’t buy anything wasteful — like plastic cups — so its “off-the-grid” party two weeks ago had acoustic-only bands, flashlights, and was BYOC — Bring Your Own Cup. This week, I visited with Nick Wolterstorff at the Institute for Advanced Studies in Culture, a think tank connected to the University of Virginia and housed in a beautiful, unmarked building on University Circle (I found it by deductive reasoning: it was the one building that did not even remotely resemble a frat house). As we sat in the dining area enjoying homemade soup and bread, which is available at the Institute most Tuesdays courtesy of a lovely woman who prepares the feast as an act of generosity, Nick pointed out some detail in the wooden molding that ran along the ceiling in the room. He helped me to see how that detail, unremarkable to the average eye, changed the entire feel of the room. The conversation quickly turned to woodworking and craftsmanship, and I remembered this essay of Nick's reviewing Richard Sennett's book The Craftsman. I am grateful for craftsmen who understand how small details can open up an entire room, and I am likewise grateful for those whose "'primordial mark of identity' is that he or she is focused on achieving quality, on doing good work." Mine is a family of craftsmen—woodworkers, to be specific. My grandfather was a cabinetmaker, my father was a cabinetmaker, I have done woodworking, my sons work in wood. I have always resented the many ways in which those who work with their hands are demeaned. R. G. Collingwood’s aesthetic theory is shaped by his contrast between “mere craft,” as he calls it, and true art; the attitude expressed is typical. It’s a strange attitude for Christians to hold, since Jesus was the son of a carpenter and since God is presented in the opening pages of Scripture as a maker, not a thinker. Sennett observes, correctly, that “early Christianity had from its origins embraced the dignity of the craftsman.” That dignity was vigorously reaffirmed by the early Protestant reformers. A craftsman, for Sennett, is someone who is dedicated to doing good work for its own sake. This good work will normally have desirable consequences; if things go well, the craftsman will get paid for what he does or makes, for example. But the craftsman is not content to aim at those external consequences; if consequences become his preoccupation, he will think in terms of getting by rather than getting it right, in terms of good enough rather than good. The craftsman’s “primordial mark of identity” is that he or she is focused on achieving quality, on doing good work. Craftsmanship is quality-driven work. Sennett holds that in thinking about craftsmanship it helps to begin by looking closely at those crafts in which one uses one’s hands to make something. But if craftsmanship is doing good work for its own sake, then craftsmanship obviously extends far beyond manual crafts. It extends to the craft of writing book reviews. It extends to the craft of governing well that I mentioned at the beginning. The American Festivals Project is a photo and video documentary that explores America’s vast—and strange—variety of small-town festivals. Ross McDermott and Andrew Owen, armed with a grant from National Geographic, cameras, video equipment, laptops, and a waste-vegetable-oil-powered truck, spent the better part of a year traveling to forty-nine states, visiting some of this nation's more bizarre celebrations of culture. You've heard of Mardi Gras and Bonnaroo, but how about the Okie Noodling Festival in Pauls Valley, Oklahoma? The Middle of Nowhere Celebration in Ainsworth, Nebraska? Perhaps, pictured here, the Woolly Worm Festival of Banner Elk, North Carolina? Sister Helen David Brancato is part of the Senior Artists Initiative, a wonderful group that exists to "assist senior artists in understanding the need for, and processes involved in, organizing their life's work, and to develop programs that provide recognition for senior artists." In this award-winning mixed-media piece, the artist presents Jesus as a grieving Haitian woman. In an interview, she said the piece was inspired by a news photograph of a Haitian woman "who had just learned that five members of her family were among 400 who perished in a ferry accident. . . . The photo led me to recall things I had seen in Haiti during a visit there in 1989. It was like nothing I had ever seen before. I saw [in it] the ongoing Passion of Christ." The twentieth-century Fauvist/Expressionist painter Georges Rouault was one of the most significant early influences on contemporary abstract painter Makoto Fujimura (founder of my employer, International Arts Movement). Rouault played a key role in the Parisian Sacred Art movement and influenced Picasso and Matisse. Last night a new exhibition opened at Dillon Gallery that pairs works by Rouault with new work by Fujimura—two painters seeking to portray fallen subjects in a redemptive light. I came across this video on Jacob Marshall's blog and it gave me a mental mini-vacation in the middle of an otherwise hectic day. What is it about music, color and movement that can instantly soothe an anxious soul? I confess that I have co-sponsored baby talk among some of my favorite under-fives. Indeed, I was crushed the day one of my nephews explained to his younger brother that my name was not, in fact, Aunt Toasty. Yet as much as I miss the days of serving up hot choplate to my friend's young son, I agree that, by school-age, it is best for children to have learned correct pronunciations (though I would draw the line at calling one's mother his old lady). The child’s language learning, now and later, is governed by two obvious motives: the desire to communicate and the desire to be admired. He imitates what he hears. More or less successful imitations usually bring action and reward and tend to be repeated. Unsuccessful ones usually don’t bring action and reward and tend to be discarded. But since language is complicated business it is sometimes the unsuccessful imitations that bring the reward. The child, making a stab at the word mother, comes out with muzzer. The family decides that this is just too cute for anything and beams and repeats muzzer, and the child, feeling that he’s scored a bull’s eye, goes on saying muzzer long after he has mastered other and brother. Baby talk is not so much invented by the child as sponsored by the parent. Eventually the child moves out of the family and into another speech community - other children of his neighborhood. He goes to kindergarten and immediately encounters speech habits that conflict with those he has learned. If he goes to school and talks about his muzzer, it will be borne in on him by his colleagues that the word is not well chosen. Even mother may not pass the muster, and he may discover that he gets better results and is altogether happier if he refers to his female parent as his ma or even his old lady.